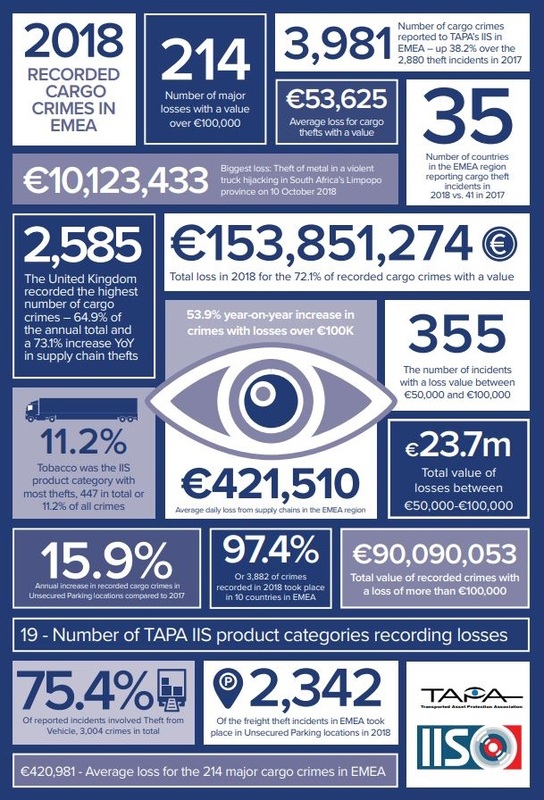 The number of cargo crimes recorded by the Transported Asset Protection Association’s (TAPA) Incident Information Service (IIS) in 2018 represented the highest number in our 21-year history and resulted in the loss of more than €153.8 million of products from supply chains across the Europe, Middle East and Africa (EMEA) region. This represents a 38.2% increase year-on-year. These figures are for reported crimes only, so in reality losses could be substantially higher. 47.9% of crimes reported were listed as unspecified or miscellaneous. The highest percentage of of thefts by products listed were tobacco at 11.2% which is up 246.5% from 2017. Unsecured parking areas were by far the most targeted areas for theft accounting for 58.8% of all incidents. Research also shows the true cost of loss of a cargo crime can be 5-7 times greater than the value of the goods stolen, once all subsequent factors are taken into consideration. 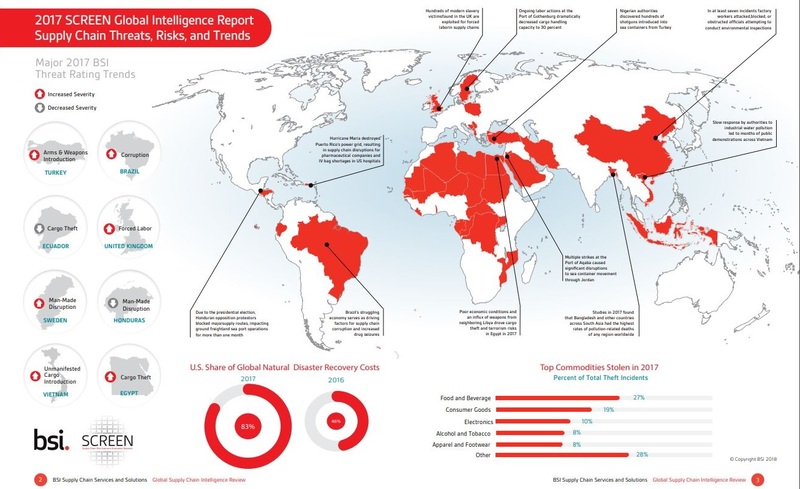 According to BSI's Global Supply Chain Intelligence report, numerous factors are influencing supply chain risks gloabally. These risks include security, social responsibility, and business continuity, many of which are provoked by one another. Wallenborn recognised the growing need for secured transport years ago and as such became an early mover in this field. Now with years of experience under our belt Wallenborn boasts a near perfect success rate when it comes to secured transportation. Safety, security, and reliability is what you can expect when trucking with Wallenborn, and securing, tracking, and delivering your goods safely and on time is our priority. Wallenborn is a regulated agent and we have been TAPA TSR certified since 2012. We were also the first asset-based company in the EMEA region to be certified at three levels – levels 1, 2 and 3. We are an Authorised Economic Operator (AEO) and an active member of the Transported Asset Protection Association (TAPA) since 2002. Wallenborn uses TAPAs industry benchmark security standards and cargo crime intelligence to underpin its secure offerings for shippers of highly valuable and vulnerable products. Each year we successfully complete various statutory, ISO, internal and external audits. This means that our logistics services meet all quality requirements and regulations in the field of safety and security, staff training levels, orderliness and cleanliness, availability and strict adherence to standard operating procedures. Whilst we strive for a 100% success rate, we are prepared for when things do go wrong. As such, we have obtained Grade AAA insurance which is also unsurpassed in the industry. Our TSR1 trucks and trailers are of the highest standard and include the below security features. All security systems are connected to certified tracking, monitoring and an intervention coordination centre. Alarm connected to monitoring centre. Alarm in case tractor and trailer are separated. To learn more about our secure transportation services or to request a quote please email LUX.request@wallenborn.com.